Sara was an extraordinary, loving young woman, with a rare combination of intelligence, talent, charm, and grace. She grew up in Amherst, Massachusetts and attended Fort River elementary school and the Amherst Junior High School before entering Deerfield Academy in 1989 as a member of the first class of women admitted to that prestigious New England prep school. Sara was an excellent student, repeatedly making the honor roll, and graduating in the top 20% of her Deerfield class. Upon graduation, she attended Georgetown University where she was a marketing major and an art minor. While at Georgetown, Sara worked at a direct marketing advertising agency, Stephen Winchell & Associates, in Arlington, Virginia, and she also worked on campus to earn extra money. Sara had a great work ethic. Sara blossomed at Georgetown. Her friends were always important to her. She was focusing on her career future when in her junior year she was tragically and unnecessarily killed. Beginning in grade school, Sara was surrounded by many friends and was an outstanding student athlete. She swam on the Triton swim team and led and pitched her softball team to the championship. She won numerous trophies in the Western Massachusetts swimming championships and always did well under pressure. She thrived on being a part of a team with her friends and on competing in sports. Entering the first class of girls at Deerfield Academy in 1989, Sara came into her own. She proved herself as a top tennis player in her freshman year. She won the coaches’ award for tennis as the most valuable player of the year. She achieved this award again in her junior and senior years. In addition, Sara was the most valuable player on the squash team in 1992 and was elected captain in her senior year as well as playing number one singles. Also in her senior year, playing defense on the girls field hockey team, Sara contributed to the team winning the prep school championships for the East. In her four years at Deerfield, no girl in her class won more trophies and awards for athletic accomplishments than Sara. Sara was an extraordinary young woman. She will always be remembered for her ever-present smile, her laughter, her unassuming way, and her vibrant, contagious spirit. We miss her so. Sara loved Deerfield, her friends, her classes, her teachers, and her sports. In addition to being an outstanding “sportswoman,” Sara blossomed as an artist. Her art teacher recognized and cultivated her painting and photography talent. David Dickinson, her art teacher and tennis coach, was in inspiration to Sara. He brought out the best of her talents in both art and tennis. This picture was taken on March 25th, 1996, two days before Sara was killed in the bus crash on her way to the Taj Mahal in India. She’s reaching behind the “Iron Pillar,” which originally stood before a temple or Fishnu and was possibly brought here, at the Quwwat-ul-Islam Mosque in the eleventh century. According to legend, if you stand with your back to the pillar and can reach around and touch your fingers, any wish you make will come true. Seven participants in Semester at Sea program killed in overseas bus accident. 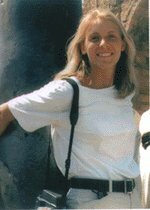 On March 27, 1996, while traveling on the Semester at Sea study abroad program sponsored by the University of Pittsburgh, Sara Christie Schewe was killed in a bus crash in India. She was on a Semester at Sea school sponsored trip to see the Taj Mahal along with over 50 other students. The road was treacherous by day, and deadly at night. Four students and three adults were killed. Three others were seriously injured. For more information about the bus crash read the October 4, 2000, testimony of John Amato before the U.S. House of Representatives Subcommittee Oversight and Investigations of the Committee on Education and the Workforce. John Amato’s daughter, Virginia, perished with Sara, Jenna Druck and Cherese Laulhere.